Easy enough to whip up quickly but elegant enough to entertain with. 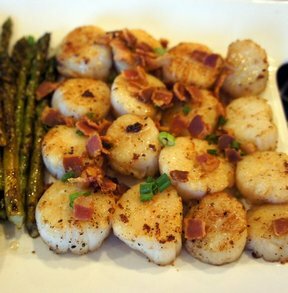 The flavor of the scallops with the bacon and green onions is perfect. In a medium skillet, fry bacon until crisp. Place on paper towels to drain. Chop into small pieces and set aside. In the same skillet, discard all but 1 tablespoon of the bacon drippings. Add oil and heat over medium-high heat. 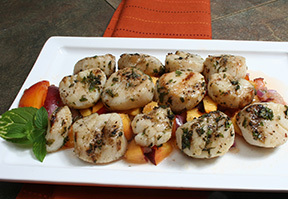 Season scallops with salt and pepper. 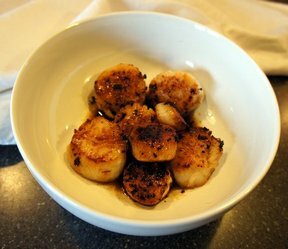 Sear scallops in skillet for 2 minutes on each side until caramelized and opaque. Be sure not to over crowd the pan; you may have to do in 2 batches. To serve, top with bacon and onions. 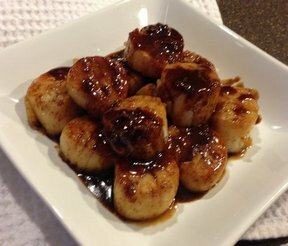 "My favorite way to make scallops! And you'll never believe how easy it is. 4 ingredients is all it takes and 15 minutes."